And people brought to him [i.e. 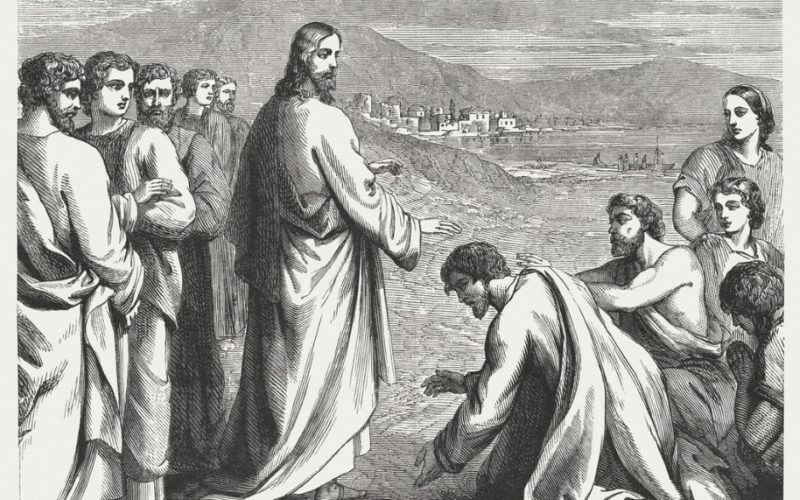 Jesus] a deaf man who had a speech impediment and begged him to lay his hand on him. He took him off by himself away from the crowd. He put his finger into the man’s ears and, spitting, touched his tongue; then he looked up to heaven and groaned, and said to him, “Ephphatha!”—that is, “Be opened!”—And immediately the man’s ears were opened, his speech impediment was removed, and he spoke plainly. Being legally blind, I know next to nothing about deafness, a fact that became all the more apparent last week as I began to prepare for this homily. For example, I found out that most deaf people do not read lips, that lip reading requires intense concentration, and that even the best lip readers, on average, can pick up only twenty-five to thirty percent of what is being said. People who read lips have to rely on context and guesswork to fill in the blanks. Thank you for turning to me for some help. This Sunday’s Gospel reminds me of a Catholic pilgrimage to France which I made with some other deaf people seven years ago [i.e. in 2011]. I thoroughly enjoyed the pilgrimage; it did wonders for my faith. One of the places we visited was the grotto at Lourdes. While there, I took some of the holy water and touched it to my ears, not that I was expecting to be cured of my deafness, but because I had enough faith to believe that God would cure me if He willed. But I asked God for His will to be done, rather than my will. So, today I still carry the cross of my deafness, believing that God has a purpose for it which is known only to Him. On another note, I still attend the interpreted Mass twice a month at Our Lady of Perpetual Help Church in Bethlehem [Pennsylvania]. On the other Sundays, I still bring my missal to Mass. And I make up for what I miss from not hearing the homilies by reading the meditations in The Word among Us magazine and information I find on Catholic websites. There you have it. The most astonishing truth I learned from Joe is that he really values homilies in sign language. Wow! By contrast, many of us who are able to hear take preaching for granted. Most of the time, I sleep through a homily, even if I myself happen to be giving it! The other amazing fact about Joe’s commentary is his tremendous faith. Instead of trying to manipulate God into fulfilling his merely human wants, Joe trusts Our Lord to do what is best. If that isn’t faith, I don’t know what is. And isn’t faith in God the best gift of all? Well, I have had to preach this homily to a deaf congregation. I stress that the important thing is not that the man became hearing. Rather that he was opened to receiving God’s word. It was as much a spiritual healing as a physical one. Thus Joe Holst and Father Linus both agree that what’s really paramount here is openness to doing God’s will. “Most people,” says the anonymous quotation, “want to serve God, but only in an advisory capacity.” How unfortunate! When it comes to God, our job is to submit rather than to direct. This idea comes from the book A Place of Healing: Wrestling with the Mysteries of Suffering, Pain, and God’s Sovereignty (Copyright 2010) by Joni Eareckson Tada. The author is an evangelical Christian who, prior to her conversion, suffered a diving accident which left her a quadriplegic, paralyzed from the shoulders down.